Estate Tax: When Can You Receive Your Inheritance? Or, when can you finally receive your inheritance? An estate that is required to file a federal estate tax return will often be frozen, until the IRS has had sufficient time to examine and accept the decedent's estate tax return. This waiting game can be agonizing for heirs of the decedent's estate, who are eager to get their hands on their inheritances. This article explains what happens after a federal estate tax return is filed with the IRS, and explores how long it takes for heirs to receive the coveted estate tax closing letter. IRS Form 706 must be filed with the IRS within nine months of the decedent's date of death, however a six-month extension may be requested using IRS Form 4768, Application for Extension of Time to File Estate Tax Return. However this extension does not delay the deadline for paying any due taxes. Consequently, estimated taxes should be paid when IRS Form 4768 is filed, to avoid interest and penalties. Of course, any delay in filing Form 706 will prolong the time it takes for the IRS to process the return, once it's filed. After receiving Form 706, it takes the IRS six-to-eight weeks to process and enter the item into its database. 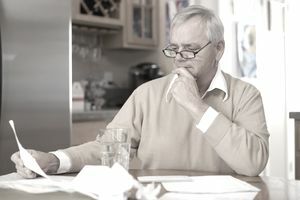 After the return is filed, it takes the IRS six-to-nine months to either issue an estate tax closing letter, or inform the executor that the estate tax return is being audited. This is contrary to information on the IRS's website, stating that it takes four-to-six months to receive a closing letter for returns that are accepted as filed. In the case of an estate tax return audit, it takes yet another four-to-six months before the audit is completed and an estate tax closing letter is issued. In extreme cases, the audit may take several years, before an estate tax closing letter is issued. If a payment is made when the estate tax return is filed, and you receive a notice that additional taxes and/or interest and penalties are due, first confirm that the initial payment has been applied against taxes due, before making any additional payments. If a nonresident decedent did not have a U.S. Social Security number, the IRS will issue an individual taxpayer identification number (ITIN), which may be used in all future correspondence with the IRS. If you wish to call the IRS with questions about a Form 706, save time by directly calling the IRS estate and gift tax unit at 866-699-4083.